In May, it will be one whole year since I sewed my first bag ever. And because Brighter Day has been life changing-ly good this year, I think it calls for a celebration. I am giving away 5 bridesmaid clutches of your choice with personalizations as a "thank you" for an awesome year. 5 of any bag in my shop - you can customize the colors and add the personalizations. This is more than a $200 value! Go to the shop: Brighter Day, and find which style of bag you might choose if you win, and leave a comment saying which style is your favorite. - Make Brighter Day one of your favorites on Etsy and leave a comment letting me know. - Pin something from the shop on Pinterest and leave a comment. - If you buy something from Brighter Day (anything! ), you get 5 extra entries (just comment for each one). I'll choose a number using the random number generator and will let you know the winner on Monday, March 26. Favorite styles: pleated clutch in garden ivory OR emma clutch in deep coral! Brighter Days is a favorite of mine on Etsy! Pinning my favorites on Pinterest on my Fashion and Style board! Favorite Style: The Foldover Ruffle Clutch in Gray Polka Dots--cute and feminine yet functional! I love the gathered clutch in winter wool and the bow clutch in dijon! I like the charcoal bow clutch! LOVE the bow clutches, so cute! i LOVE the foldover ruffle clutch!!! I would choose the dijon mustard clutch. Love that color and style! Brighter Day is under my favorites on Etsy! Pinned the foldover ruffle clutch in gray polka dots. I pinned the teardrop filigree earrings and the gathered clutch in black on Pinterest. Brighter Day is one of my faves on etsy! girl you know i follow your blog haha i am loving the bow clutch in dijon and evening clutch in khaki/cream. Can i get like bonus entries for being a former roommate or something? :) love you! I am a follower! Found you through Homemade by Jill a while ago. I love the fold over ruffle clutch in the polka-dots! I just looked at your shop and have several favorites :). I love the Bow Clutch in Charcoal, or the Emma Clutch in Grey and Coral, or the Evening Clutch in Ivory and Amber, or the Gathered Clutch in Grey with Light Teal flower. By the way I LOVE your blog. Stumbled on it from some other crafty blog (don't know for sure where) and I love your projects! Thanks! I'm a follower of the blog :)Yay Whitney! Pinned the evening clutch on Pinterest! ...and my favorite (right now) has to be the Evening Clutch in Purple Paisley. I love the Gathered Clutch in Garden Lavender. The colors are fantastic! I favorited BrighterDay on Etsy! I am subscribed to your blog through RSS! i LOVE the emma clutch!! I love the bow clutches! I think I would pick the grey color in the style of the dijon bow clutch. I was just a part of my best friends engagement and she asked me to be one of her bridesmaids! I think this would be a perfect gift for her. She would love it! I would probably get the Ruffle tote. Everything else is beautiful but I need a large bag because I carry EVERYTHING in my purse, lol. -I added you as a favorite on Etsy. -I'm a follower of your blog. -Pinned the "Gathered Clutch in Black Dupioni Silk with Pleated Flower"
My favorite is the "The Foldover Ruffle Clutch in Midnight Blue". I am getting married July 7th and it looks like it would match the bridesmaid dresses PERFECTLY! -And am now following your blog! Thanks for the awesome giveaway! I'm super excited!!!! i am getting married in july and have 5 bridesmaids so this is a perfect giveaway! i wanted to make my own bags for my friends, but i'm overwhelmed by all the planning and decoration making. the pleated clutch in garden ivory would be great for the ladies! And I am following your blog too. Love the evening clutch in purple paisley - love all your bags tho!! It is really hard to choose which bag! I love them all! My favorite is probably the winter wool one though! The polka dot in gray is a close second though...but tied with the dijon clutch! Oh this is difficult! They are amazing. I love your blog. I check every day to see what else you have written about! Hi! I don't really remember how I ran across your blog but it's quickly become a favorite! Anyways, it would be a toss up between the bow clutch and the ruffle clutch, but I think the ruffles would win out - especially if they came in some sort of polka dot fabric! I love the gathered clutch in grey shantung!! So gorgeous!!!!! I pinned your gathered clutch on Pinterest too!! and I favorited Brighter Day on Etsy!!! Yay!!! I hope I win!!! Your shop has been in my Etsy favorites for a long time! When you wrote your "Unsolicited Etsy Advice" post, I told my husband that I wanted your purple paisley evening clutch for my birthday :) It's my favorite in your shop! I pinned this bag a long time ago. I've also pinned your DIY bow clutch, and for good measure, I pinned this one today. This is such a great giveaway! I am getting married in June and have 5 beautiful bridesmaids. I absolutly love the Bow Clutch in brown. My little sister is getting married in June and loves the the bow clutch! She would probably want it in chocolate brown though. If I win I'll definitely donate the bags to her/her bridesmaids! New follower. Love your stuff! I wood pick the grey whool one! Gorgeous! oooh, in that case, bring on the entries! My favorite style of bag is the gathered clutch. I've got four girlfriends and we are celebrating our 23rd year of friendship...this would be a great gift! I love the grey Bow Clutch! I added you as a favorite on Etsy, pinned something and I own one of your bow necklaces! Thank you! I made Brighter Day one of my favorites. And, I bought a purse for a friend in October, but I'm sure that probably doesn't count! :-) Thanks for letting me enter! Your items are very wonderful!!! I favourite BrighterDay on Etsy! I'm a follower on GFC as Silvia M.
Love the Evening Clutch in Black Shantung with Ivory Rose, but as I'm entering for a close friend, she'll have to pick her favorite! the day clutch in khaki and cream! The Fold-Over Ruffle Clutch is fabulous. I especially love the patterned fabrics too! I'll be honest... I'm from Italy, and I ended up here just because one friend of mine told me about the giveaway. But I'm so glad she did! This blog is so sweet and full of joy and beatiful things of every kind. Sooo, I'm gonna enter the giveaway, anyway, but I'm gonna read the blog from A to Z!!! Love following your sweet blog, one of my favorites on etsy (Alicia McDaniel) and pinned on pinterest. Hello, My name is Trisha and I'm a new follower. Love the blog and LOVE the bow clutch tutorial. It was super easy to follow and I just made my first wristlet ever. Thanks to you! However, I love the gather clutch in gray and yellow. Yellow is my favorite color, so happy. Such a great giveaway. Thanks for the opportunity to win. I already had one of your items as one of my favorites. Also love the gray/white polka dot. I pinned the Gathered Clutch on my wish list pin-board. I've faved you on Etsy! I've pinned you on Pinterest, too! My son and future daughter in law are getting married in August - the clutches would be wonderful for their wedding. love, love, love the ruffle tote or ruffle clutch. anything ruffled appeals to me - and your bags are just beautiful! And I followed your site! I'm getting married on June 3rd and would love to gift your bags to my wonderful bridesmaids! My favorite bag is the Gathered Clutch in Gray Shantung. It is beautiful! And I made Brighter Day a favorite on Etsy! And, I pinned my favorite bag to pinterest! Have a beautiful day! I love the bow clutch in Dijon, and the ruffle tote, and the bow clutch in charcoal... Too many cute ones to choose from! You're a favorite on Etsy! Been reading for awhile after a referral from a friend. Now I am following you! I love the Gathered Clutch - so cute!! I made Brighter Day a favorite on Etsy. I pinned your bow clutch on Pinterest!! I love the bow clutch- so pretty! I LOVE the bow clutch in dijon! So cute! I favorited you on esty. They are all lovely lovely lovely, but what i liked the most is the Gathered Clutch in Gray with Light Teal Flower.. I follow your blog on Google Reads. Oh Whitney! How cool! I'm getting married in August and have exactly 5 bridesmaids! How cool would it be to be able to give one of these beautiful bags to each of them! Well, I already follow your blog... I check in here at least once a week... usually more like 5 times a week! I just favorited you on etsy! I realize I probably should have done this LONG ago! 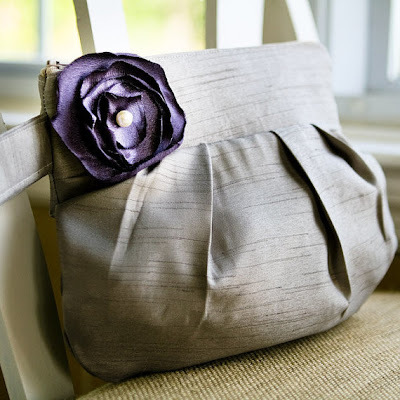 I love the ruffle tote in dark grey and any of the evening clutches... oh in fact I think any bag you make is adorable!!! And just pinned up the grey tote bag!! I LOVE it! Love both the gathered and bow clutches!! But all are beautiful! I love love love your gathered clutches in any yellow and grey pattern :) And I have exactly 5 bridesmaids! How perfect. Just pinned the personalization picture :) So cute.